Greetings! As a kid I always wanted a layout but didnt have the space for something permanent. Finally as an adult our new house finally has space so im reliving my childhood and hoping my kids will get involved as they get a little older! Going for an 8ft by 4ft in our roof space, could maybe have pushed for more space but we still need some storage space. Since got the top screwed down and the holes filled in as well as hiding the screws with polyfilla so it all needs a sand now. Had to cut the top into four slices unfortunately to get the thing into the roof space which was disappointing. A quick go with SCARM to give me an idea of what i wanted. I had three prerequisites. 1) had to have a tunnel. 2) had to go round and round and round. 3) had to have at least two lines for running in opposite directions. All the new track I ordered came today also, but haven't had a chance to get it laid out on the top though. I do have a few boxes of old bis and peices that i inherited but its not up to much and has lots or rusted fishplates and broken sleepers. next problem is working out how I need to wire the lot together. Ive decided im going to run off DCC, makes sense plus it gives me control via PC further down the line, which is my end goal. this is very new to me so its been a steep learning curve, mechatronics/electronics are not something i have any experience in. to help Ive since got a Hornby Select and Hornby Accessory decoder to run everything but ive not had much success with my first dive into DCC. Having converted an old Lima Class 87 with a Hornby 8 pin chip i thought i was set but it refuses to acknowledge any commands i give it other than which direction to go in and emergency stop which cuts power. not so good, so ive bought another dcc ready dmu that i can then stick another 8 pin chip i have into and see what happens. more reading needed in the mean time! Last edited by 8vchris on Thu Mar 15, 2018 10:02 am, edited 3 times in total. Great start with a nice bit of woodwork there. Lots of advice on here that will keep you busy reading for a long time! Hopefully you'll be able to solve that lock problem too, cant say im an expert in DCCing old locos im afraid! Welcome, you have come to the right place for getting friendly help and ideas. 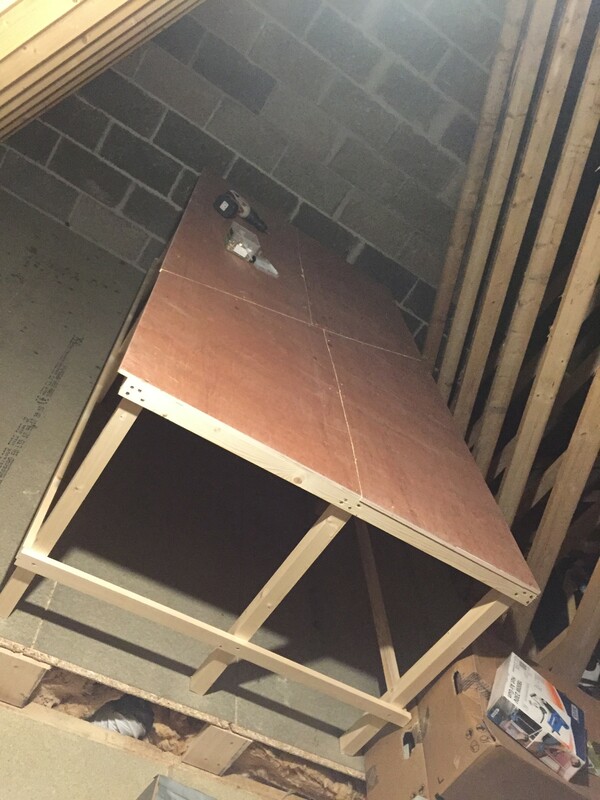 Is the layout going to stay where you've shown it, up against the roof timbers? Because, trust me, you are going to need access to both sides of the layout. A good rule of thumb is that you should never have to stretch more than two feet to reach anything. This is the problem with solid oval layouts. If you can't move the whole layout, you've got loads of space in the middle and you could cut an access hole there, but then you'd have to modify that low-level leg bracing so you could duck / crawl through. Oh, and I hope you've got some bracing under the boards. You might have to change that as well. Oh dear, getting complicated, isn't it? then it shouldn't be too much of a problem. Hard wiring decoders into Lima DMU's can be a problem, in those with a minimum of wires. decoders they can be a handy simple DCC unit. Also Lenz work well with a Select in my experience. Thanks folks, its a rather steep learning curve. To address both points raised about the board, yes its movable, its been shuffled into the middle of the space to let me get up both sides. 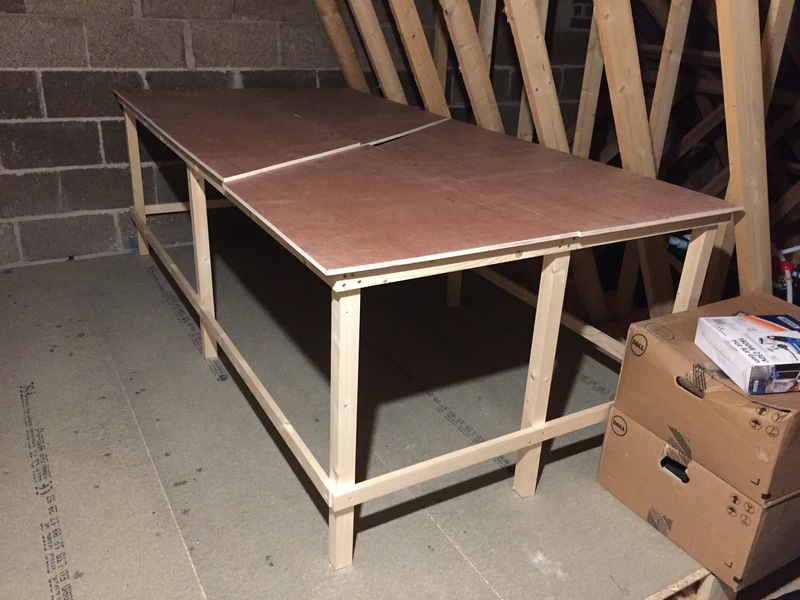 Toyed with the idea of fixing it to the floor but thought better of it on the basis i will need to get around it even though my ridiculously long arms can reach across to the far side. Also, underneath has been well braced up, theres a beam running though the middle from end to end as well as various bits and pieces bracing up the cuts to make sure they are all exactly level. I had considered having space in the middle to stand but its not big enough to justify that and I'd like to have some scenery there instead. The cuts are running at an angle to give me space around where the points will end up meaning i can run my points motors underneath. 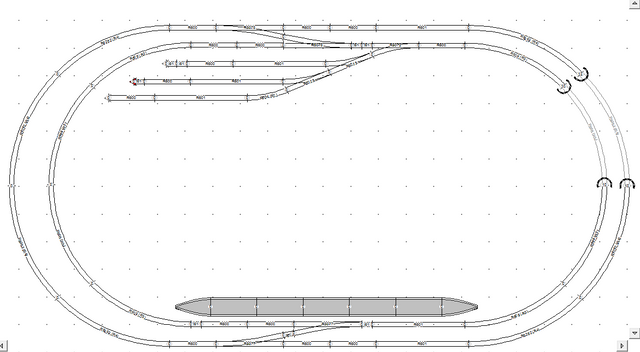 Ive since been fiddling around with new track to see if that makes a difference with the running of the Lima loco but its made no difference so at least it rules out an issue with the track. Im currently waiting on the arrival of a dcc ready loco that I can drop a decoder into and try to rule out a Select issue but I can't imagine it being that. 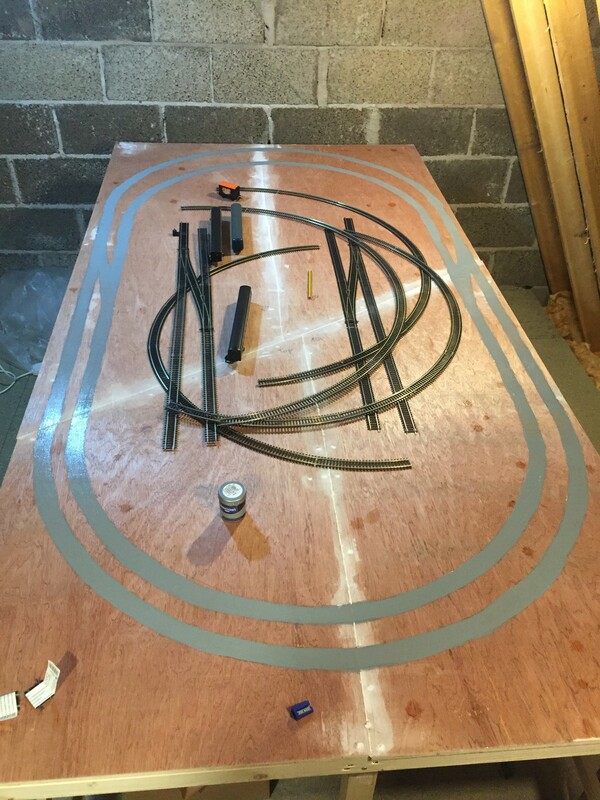 Time permitting I'll maybe get the track laid down on the board later for a first fit and see how we go! It looks quite a nice plan to get some trains running. 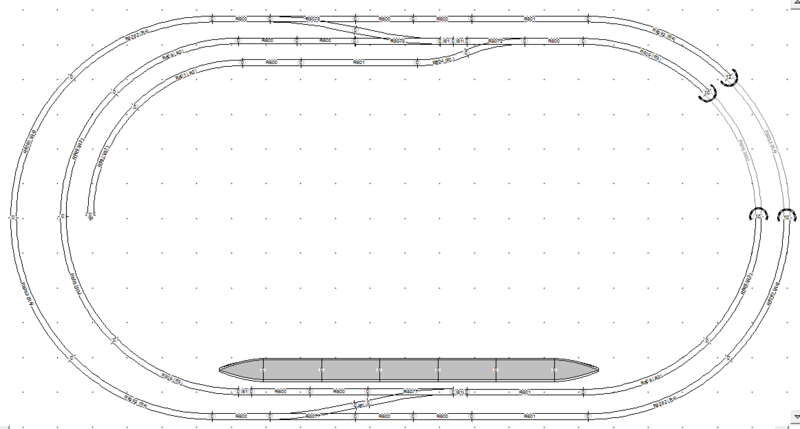 I've had quite a head ache trying to tame some wayward trains but in the mean time, i've got my track plan laid out on the board. Once the paint dries the plan is to lay the track down again, work out where the feeder wires are going and drill some holes. once done then it can be laid for the last time! i hope so, im looking forward to the first time they trundle round via dcc, preferably under control!! I've wired in some more lights to the roof space so I can at last now see what I'm doing properly. All the holes for the mainline and points have been drilled and need the dropper wires soldered onto the bottom of the tracks and then the tracks laid one last time. I'm hoping to get some time tomorrow evening to sit and solder the dropper wires on. Getting there! Things are progressing well by the look of it.